The World Health Organisation (WHO) estimates that worldwide obesity has more than doubled since 1980, and that most of the world's population now live in countries where obesity and being overweight are responsible for more deaths than being underweight (WHO 2015). Estimates by McKinsey Global Institute suggest that almost one third of the global population is overweight, and that obesity accounts for about 5% of deaths in the world (Dobbs et al 2014). 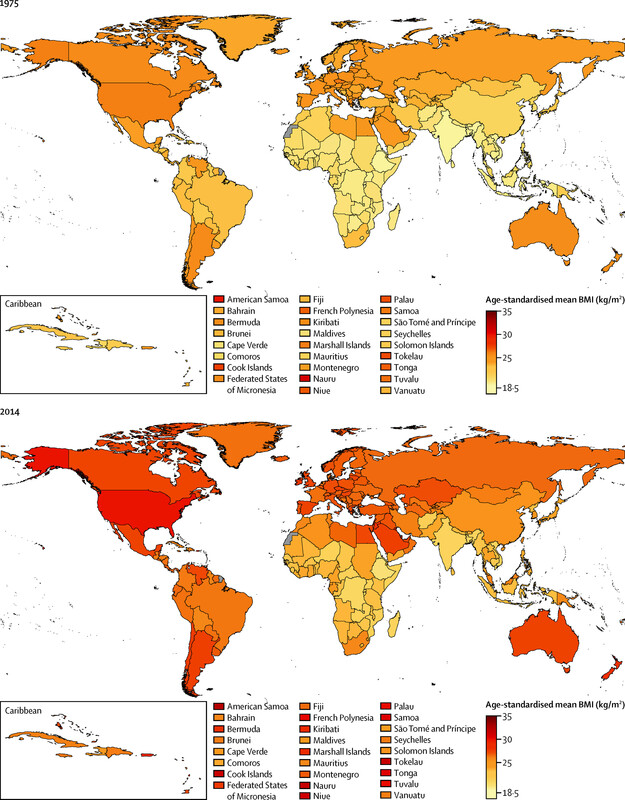 -There has been a sizeable increase in calories available, according to aggregate data on food available for human consumption (the total amount of food produced, including imports and excluding exports, minus food used for animal feed, agriculture, industrial uses, and waste) (see Bleich et al. 2008 and FAO 2005). While all four observations are true, the full picture is more complex. In a new study, we used data from the official UK government household survey over 30 years (from 1980 to 2013) on the food spending of a representative sample of households, along with nutritional information, to provide a more comprehensive overview of how the calorie content of the foods that households purchase has changed over time (Griffith et al. 2016). Surprisingly, we find that total calories purchased have declined substantially over the last three decades. We distinguish two periods: 1980-2007, when food prices were falling; and after the Great Recession (2008-2013), when food prices increased worldwide and real incomes fell for many people. 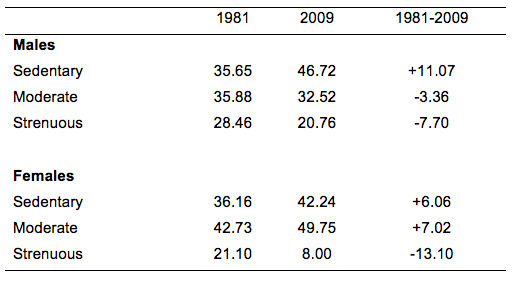 Table 1 shows the continuous decline in mean calorie levels regardless of food price changes. In the paper we show that this decline is not just occurring at the mean, but also across the distribution. Source: Table 4 in Griffith et al. (2016). One important reason for this decline in calories, contemporaneous with a rise in real expenditure, is that households have shifted away from homemade food, and toward market-produced food (for example by shifting from food at home towards eating out), which is more expensive. The other reason is that there has been a decline in the purchase of some high calorie foods for consumption at home, such as red meat, full fat milk, butter, and jams, and this more than compensates for the increase in calories from foods and drinks outside the home. This leads to a puzzle: if people are buying fewer calories, and so presumably consuming fewer calories, how do we explain the rise in obesity? Weight gain arises from a caloric imbalance; that is, when more energy is consumed than expended. If there has been a decline in total calories purchased over the past 30 years, could an even greater decrease in levels of physical activity explain the rise in obesity? We compile new data on the strenuousness of paid work in order to investigate that question. Data from the Labour Force Survey, a nationally representative survey of individual work patterns, shows that there have been significant changes to the nature of work. England has seen a marked shift over the last thirty years towards less strenuous and more sedentary occupations. This change is observable in many countries, but it has been particularly pronounced in England (Schettkat and Yocarini 2006, Bleich et al 2008), due largely to the substantial shift towards service sector jobs. Table 2 summarises these changes. The fraction of men working in strenuous occupations has declined by 8% from 1981-2009, and those working in sedentary jobs has increased by over 11%. For females the decline in strenuous occupations is over 13%, with an increase in both moderately strenuous and sedentary jobs. Source: Table 7 in Griffith et al. (2016). Change in the strenuousness of work and daily life has been studied by other researchers (and for other countries). Lakdawalla and Philipson (2009), Lakdawalla and Philipson (2007) and Lakdawalla et al. (2005) suggest that reductions in job-related exercise play an important role in increased weight, and that perhaps up to 60% of weight gain in the US is due to declining physical activity. Two other recent studies also suggest that declining activity levels in the US play an important role (Ladabaum et al 2014 and Sturm and An 2008). Finkelstein and Zuckerman (2008) relate the rise in obesity in the US to a combination of declining food costs, particularly of processed high-calorie foods, and an increase in the use of technology that makes the economy more productive but the population more sedentary. However, these studies that have emphasised the role of physical activity and technological change have received less attention – in the research community and in the media – than those that emphasise an increase in calories. The change in work patterns has had a big impact, because work accounts for a large share of people's time. In addition, labour supply behaviour has also changed, with different trends for males and females. Female labour force participation amongst 25-64 years olds has increased from 55% to 69% between 1980 and 2009, with particularly strong increases among younger women (aged 25-39). Hours of work (conditional on working) have remained constant around 26-27 hours per week on average, but have increased over time among women aged 45-49. During the same period, men have reduced their hours worked by 9.3%. For men, both changes in the amount of time spent at work and increasingly sedentary occupations have led to reduced activity at work. Women, in contrast, have increased the amount of time they spend in market work, but the strenuousness of work has declined parallel to that of men. In order to understand the implications this has for weight gain we need to know what sorts of activities females have substituted away from (were these activities more or less strenuous than work?) and what activities males are substituting towards. We also need to know what has happened to other activities of daily life. Over time, working women have increased time in market work, and so have reduced the time they spend on other activities from 60% to 54%. They have also reduced the amount of time in strenuous domestic work by 4 percentage points (see Table 3). On average, house work is more strenuous than the kind of market work that women were doing in the labour market, so this led to an overall reduction in the strenuousness of life. Men have reduced the time they spend at market work over the last 30 years. While they increased the time they spend doing housework by a small amount, they switched from strenuous housework activities like maintenance and DIY to less strenuous ones like child care and shopping. Overall, changes in the nature and time spent on housework contribute towards a decline in the physical activity among both men and women. In addition there are other changes to the way people used their free time, for example, more time watching TV; and while females now spend more time doing sports and exercise, this accounts for a small amount of time use, and so has a negligible effect on overall strenuousness. Source: Table 6 in Griffith et al. (2016). Overall, we see that declines in physical activity at market work and in other activities has largely counteracted the reduction in calories. As well as going some way toward explaining the rise in obesity, our research indicates that market work might also influence the types of foods we eat. Households that spend more time in market work buy more market-produced foods. They eat more often in restaurants and fast food outlets, and eat more takeaway. Market-produced foods are on the whole more expensive than home-produced foods, and this means that trends in expenditure do not necessarily mirror trends in calories. What implications does this research have for policy? It does not mean that we should abandon policies that target food spending or calories, such as the recent introduction of a tax on sugary drinks in the UK (for a discussion, see Griffith et al 2016a). People are eating too much given their low (and declining) level of physical activity at work and at home. It does mean that physical activity and calories are linked in potentially complex ways, and it is important to better understand this and the implications it has on people's behaviour in order to inform policy. Baum II, C L and S-Y Chou (2011) “The socioeconomic causes of obesity”, NBER, Working paper 17423. Bleich, S, D Clutler, C Murray and A Adams (2008) “Why is the developed world so obese?”, Annual Review of Public Health, 29: 273-295. Currie, J, S Della Vigna, E Moretti and V Pathania (2010) “The effect of fast food restaurants on obesity and weight gain”, American Economic Journal: Economic Policy, 2(3): 32-63. Cutler, D M, E L Glaeser and J M Shapiro (2003) “Why have Americans become more obese?”, The Journal of Economic Perspectives, 17(3): 93-118. Dobbs, R, C Sawers, F Thompson, J Manyika, J Woetzel, P Child, S McKenna and A Spatharou (2014) "How the world could better fight obesity". FAO (2005) "Supply utilization accounts and food balance sheets - background information for your better understanding" Food and Agriculture Organization of the United States. Griffith, R, R Lluberas and M Lührmann (2016) “Gluttony and sloth? Calories, labour market activity and the rise of obesity”, Journal of the European Economic Association (also CEPR DP 11086 ). Griffith, R, M Luhrmann, M O'Connell and K Smith (2016a) " Using taxation to reduce sugar consumption ", IFS Briefing Note BN180. Ladabaum, U, A Mannalithara, P Myer and G Singh (2014) “Obesity, abdominal obesity, physical activity, and caloric intake in us adults: 1988-2010”, The American Journal of Medicine. Schettkat, R and L Yocarini (2006) "The shift to services employment: A review of the literature",Structural Change and Economic Dynamics, 17(2): 127-147. Sturm, R and R An (2008) “”Obesity and economic environments”, CA: A Cancer Journal for Clinicians, 118 (531): 1385-1417.